Atomic collisions offer some unique opportunities to study atomic structure and reaction mechanisms in experiment and theory, especially for projectiles of high atomic number provided by modern accelerators. The book is meant as an introduction into the field and provides some basic theoretical understanding of the atomic processes occurring when a projectile hits another atom. It also furnishes the tools for a mathematical description, however, without going deeper into the technical details, which can be found in the literature given. With this aim, the focus is on reactions, in which only a single active electron participates. 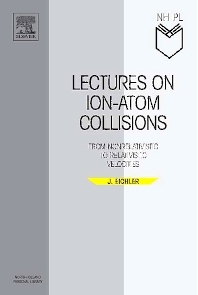 Collisional excitation, ionization and charge transfer are discussed for collision velocities ranging from slow to comparable to the speed of light. For the highest projectile velocities, energy can be converted into mass, so that electron-positron pairs are created. In addition to the systematic treatment, a theoretical section specializes on electron-electron correlations and three chapters are devoted to selected highlights bordering to surface science and to physics with antiprotons. Graduate students and professional scientists interested in atomic collisions. Also graduate students and scientists in adjacent fields.